By LaGayle ~ May 16th, 2012. 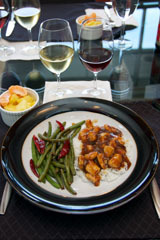 General Tsoâ€™s Chicken is one of the Wine Peeps favorite dishes, and we especially enjoy it prepared extra spicy. An added consideration in planning and preparing our challenging wine pairing meal this time is that John has been diagnosed with a gluten allergy, so I prepared the dish gluten free and was pleasantly surprised with the results. We rounded out the meal with spicy Schezwan green beans, white rice, and a mixed fresh fruit cup of pineapple chunks and mandarin orange slices. After consulting What to Drink with What You Eat by Andrew Dornenburg and Karen Page, we decided to try a GewÃ¼rztraminer and a Pinot Noir. 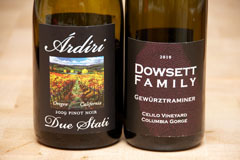 The two wines that we had with the meal were the 2009 Ardiri Due Stati Pinot Noir from California and Oregon and the 2010 Dowsett Family GewÃ¼rztraminer from Washington. Both wines were excellent! We vacillated back and forth as to which was the better pairing with the foodâ€”at first, the GewÃ¼rztraminer seemed to be the favorite, but once the meal was completed, we concluded unanimously that the Pinot Noir paired better. But really, you couldnâ€™t go wrong with either one. If you are in the mood for a white wine, a GewÃ¼rztraminer is a good choice; and if you would prefer to have a red wine, a Pinot Noir works wonderfully. Weâ€™d love for you to share in the comments what you would have paired with this meal. And, as always, we welcome your suggestions for challenging wine pairings for us to try in the future. 2009 Ardiri Due Stati Pinot Noir (70% California and 30% Oregon): Medium deep purplish red in color. Nice nose with strawberry, red cherry, and oak aromas. Beautiful red cherry, strawberry, earth, and spice come through on the palate. Medium-bodied with crisp acidity and medium tannins. Well-balanced with a long finish. An excellent food wine. 2010 Dowsett Family GewÃ¼rztraminer (Celilo Vineyard, Columbia Gorge, Washington): Pale to medium greenish straw yellow. Aromatic with apple, pear, and white peach on the nose. More gorgeous white peach and pear come through on the palate. Slightly off-dry and medium-bodied with crisp acidity. Well-balanced with a very long, refreshing finish.